Eskanazi Health Palliative Care cycling team welcomes Allan Edmonds as he prepares for his fifth Ride Across Indiana (RAIN) and fourth time participating in Ride to Remember event in honor of Eskenazi Palliative Care patients. Edmonds says his favorite training ride is either the Nashville 90 that takes place in Bloomington, Ind. or any other ride around the Bloomington area with his cycling friends. Edmonds joined Eskenazi Health Cycling team for R2R6 to support and promote the Eskenazi Health Palliative Care program. Edmonds also participates to remember both a nephew and cousin who passed away this past year. His favorite memory from a ride came from the most recent Nashville mile when the riders had to dismount the bikes, carry shoes, socks and bikes a quarter of a mile through thigh-deep, moving water. 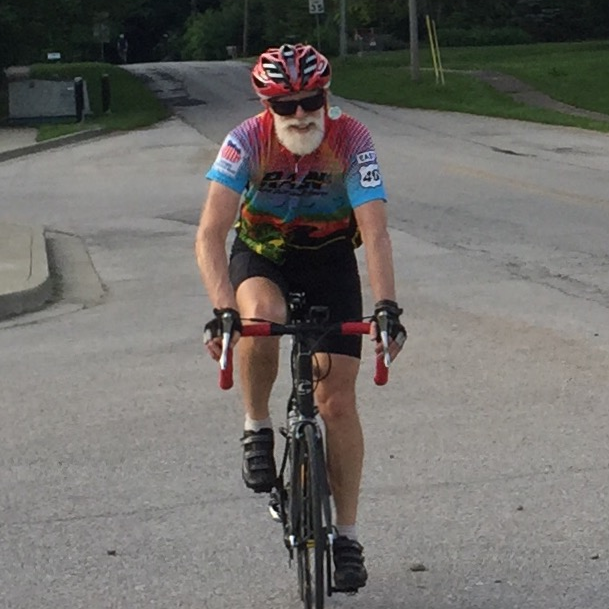 This entry was posted in Bloomington Bicycle Club, Eskenazi Health, Palliative Care Program, patients, R2R6, RAIN, Ride Across Indiana, Ride to Remember, rider, team and tagged Bloomington Bicycle Club, Cycling. RAIN, Dr. Gramelspacher, Eskenazi Health, Eskenazi Health Palliative Care Program, Palliative Care, R2R6 Team Palliative Care, Ride Across Indiana, Ride to Remember, Team on June 25, 2015 by Dr. Greg. Eskenazi Health Palliative Care Program is very excited to annouce their partnership with Premier Hospice & Palliative Care for the Ride to Remember on July 11. Premier Hospice & Palliative Care focuses on bringing first‑class care to the warmest, most serene environment possible: home. Premier Hospice & Palliative Care provides the full spectrum of hospice treatment, thoughtfully tailored to patients and families, with focused attention given to individual needs and preferences. Eskenazi Health Palliative Care Program is happy to partner with Premier Hospice in the Ride to Remember event in order to support the patients and families that both organization have worked together to support over the past year. If you are interested in supporting the Ride to Remember, donations can be made to the Eskenazi Health Foundation in c/o the Eskenazi Health Palliative Care Program. This entry was posted in Eskenazi Health and tagged Eskenazi Health Palliative Care Program, Hospice & Palliative Care, Palliative Care Program, Premier Hospice & Palliative Care on June 25, 2015 by Dr. Greg.